On Monday Melanie and I drove out to Kure Beach, NC for a couple of nights. 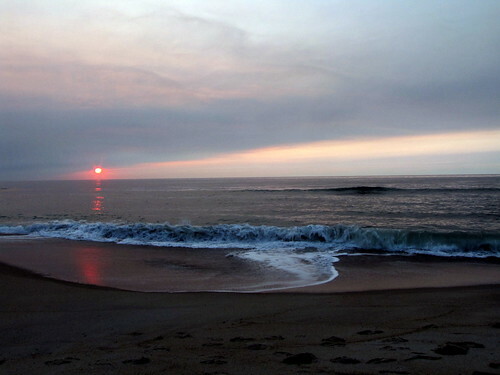 We picked Kure Beach on a whim. 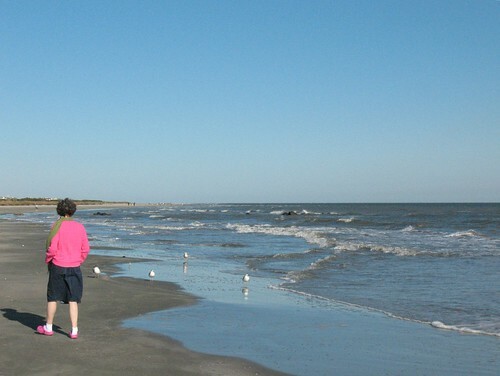 We had been looking around and had considered Charleston and Tybee Island. While searching around I came across the website for the Southwind Motel in Kure Beach. It is a small family owned place and was the kind of place we were looking for. It was on the beach and affordable. Kure Beach is nice. It's a little out of the way and not too crowded and it's not a complete tourist trap. We got to spend time walking on the pier and the beach, swam in the ocean and got a couple of hours of good beach time in. We also got some good reading done while sitting on our room's balcony. Good time. This is the view from our room's balcony. You can see the pier on the left. The pier was a short walk away. There were a couple of decent looking restaurants (I say decent looking because our room had a kitchen and we ate in the whole time), a couple of shops and a game room. Nice little area. The pier had a few regular pelicans that would wait for scraps from the the dozens of fishermen who were on the pier all the time. Some of the fishermen would toss into the waiting maw of a pelican undersized fish they couldn't keep. 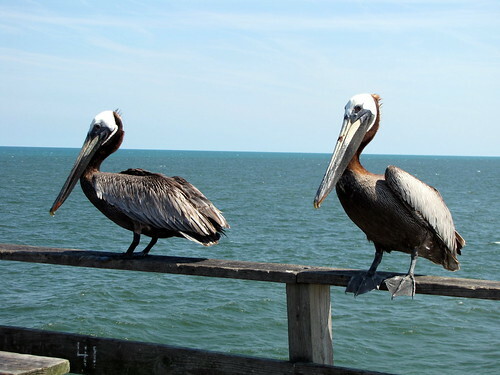 One pelican would get in behind a fisherman whenever he heard the reel. The pier was a busy place. People were fishing there constantly. When I got up at 5:30 to photograph the sunrise there were people out there already. There was a shop you had to pass through to enter the pier and that shop had a display of all the big catches made off that pier. I didn't seen anyone catch anything over six inches long. I decided I was going to get a shot of the sunrise. I had to set my alarm for 5:30. I don't remember the last time I did that. 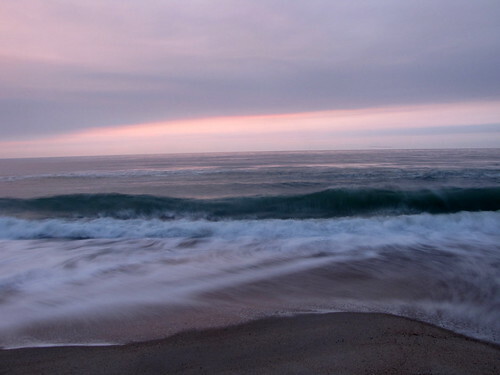 This is the a long exposure of the surf before the sun arrived. 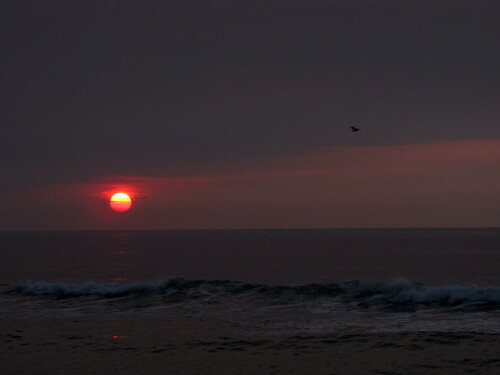 This was only the second time I had seen the sun rise out of the sea. Incredible. Nothing like it. 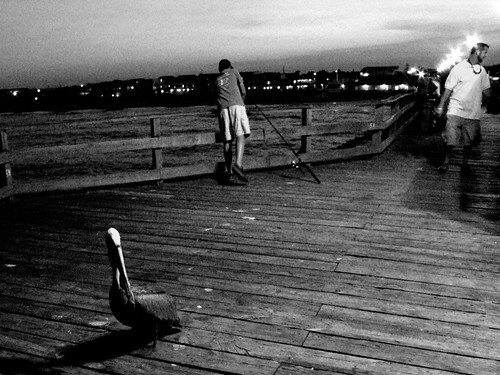 Another hungry pelican on the pier. We walked on the pier a few times. I really like walking on fishing piers on the Atlantic Ocean. 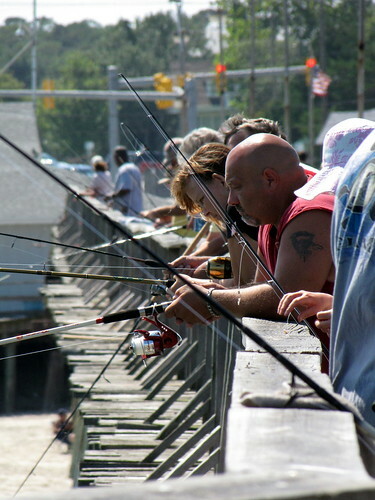 You can watch people fish and you get nice views of the beach and ocean. I think this shot of Melanie sums up nicely the good time we had. We are heading to the beach for a couple of days in a few hours. Our destination is Kure Beach, NC. We found a nice motel right on the water for a good price. I am really looking forward to this which, I guess, is why I am awake at 6:30. 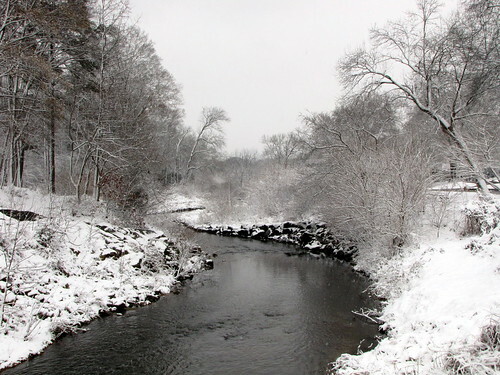 In December of 2010 Charlotte was pummeled by a good 4 inches of snow. We barely survived. It was worth it because we had a chance to go to Freedom Park and take pictures. Good times. 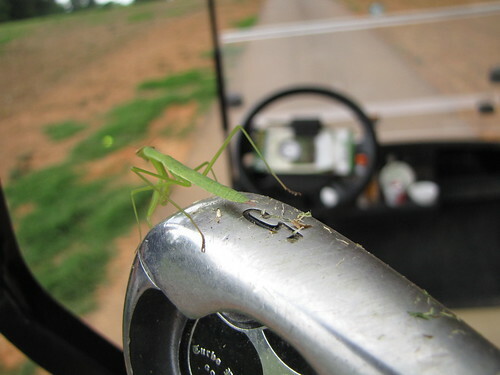 Yesterday Barry found a young praying mantis on his golf clubs. It was so thin and light green that it was almost transparent. Today I played in a casual tournament that was raising money for a youth group for a church in Clemmons, NC. We played at Salem Glen Country Club and it is a really nice golf course. There are a lot of elevation changes and a nice use of doglegs, water and hazards. I didn't take a lot of pictures because, honestly, I wasn't hitting the ball well and too busy brooding on my bad golf game. 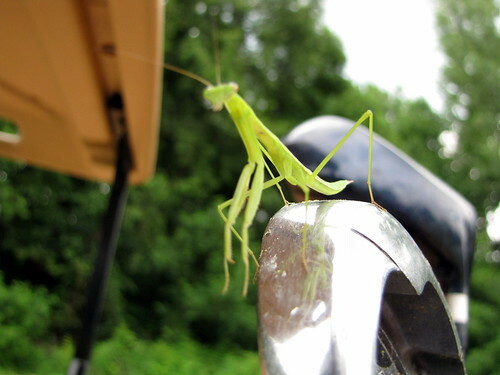 Today was odd, I just wasn't hitting the ball well. These two panoramas turned out pretty good. Tonight Melanie and I are driving to her sister's house for the weekend. Tomorrow her brother-in-law Jon and I have a golf outing at a place called Salem Glen Country Club. If they are honest on their webpage it sounds like a fun and challenging course. 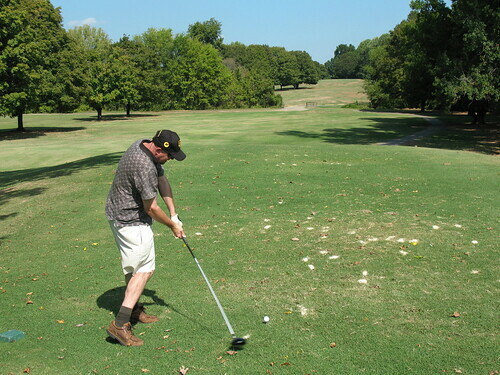 In honor of golf, below is a shot of my friend Chis in 2007, teeing off at the old #8 at Revolution Gold Course. Yes, he is wearing my Glen Lake Lakers hat I purchased at a football game while on vacation.